Sabina came from a very successful breeding of blood trackers. The breeding of Gerte to Zalud produced two litters, 9 females and 2 males in total, and almost all of them have been accomplished natural blood trackers certified by Deer Search. 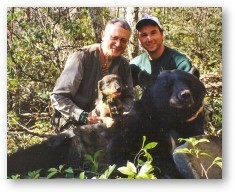 Sabina was our top tracking dog from 1999 to 2006. She had a great nose and worked slowly and meticulously. Her specialty were old, cold lines with no visible blood. Sabina had successfully worked wounded deer lines over 30 hours old and bear lines over 48 hours old. 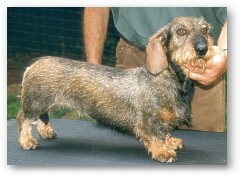 In 1999 she was number one field trial dog in the USA and in her field trialing career won 11 Absolute wins. She has recovered 76 deer and 2 bears. On October 7, 1995, when she was just 7.5 months old, Sabina passed the Deer Search Certification Test with a score of 92 points, Prize I, but one of the official judges did not show up. 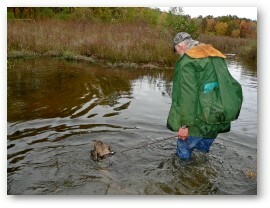 A year later, Sabina received a score of 90 in the Deer Search Blood Tracking Competition held at Scio. Sabina produced such accomplished blood trackers as "Hunter" owned by Kevin Breaux from Texas, Dale Clifford's "Sabrina", who won the DSI blood tracking competition twice (at the age of 2 and 3 years) and Wade Tupper's Graf. 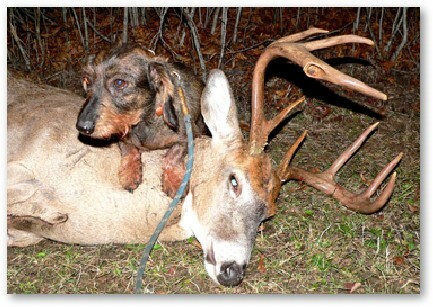 Sabina with the spectacular buck she recovered in 2005 in the Albany County, NY. Sabina was a very tough and courageous dog. This wounded buck she was tracking went after her and John. Yet, she was ready to track him further. The rest of the story can be read in John's book. The picture shows her after she got home from a vet, with multiple stitches. 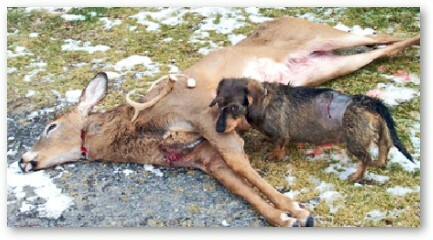 October 2006: A hunter bowshot this doe and could not locate her; he left her overnight in the woods. 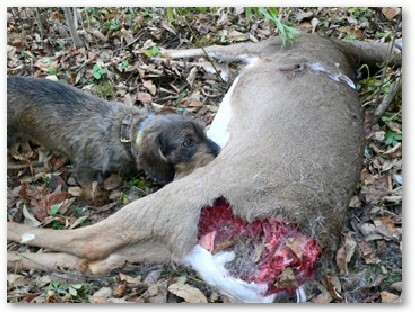 Sabina tracked the doe next day and found her with ease. Unfortunately the coyotes got there first.